Congratulations to FILSKI who has won Local Motors first ever engineering competition! Congratulations to the braunarsch (2nd place), and ely862me (3rd place)! Every contestant's entry was scrutinized and voted on by the whole LM community, and after the voting was closed (Tuesday 12pm est) these three individuals had the highest scores. But, every entry was strong and feasible for the Race Edition Rally Fighter; which says how competitive this really was. Each contestant started with three things; a competition description, an igs file of the roof section of the Rally Fighter, and an igs file of the lights. From these three things alone all of the contestant met or exceeded every required deliverable; providing the community with fantastic innovative designs, and a complete understanding of the designs. By making our chassis data available this became an open source engineering competition with each contestant employing their own CAD software skills. This is the first of many engineering competitions of this nature as we finalize and release more chassis data for the Rally Fighter. Everyone here at LM is impressed and awed by the quality of the entrys! Thank you to all of the contestants for their hard work and great effort in this competition. We look forward to the next competition! The submission period for the Roof Mounted Light Bar Engineering Competition has come to an end, and has been a great success! There are 12 entries, each of which is impressive in it's own right. Each entrant took a very different approach with their design. These diverse submissions are the essence and beauty of the open source aspects of this competition. All we gave to the public was the ignition kit (click here to download it) which includes .igs files of the roof section of the Rally Fighter and the 8'' lights we are using, and the following guidelines. Must be foldable, reducible, removable or covered to protect the lights on the roof while not in use. Now that the submission period is closed it's time to vote on the best design. But, when I say design I don't mean just aesthetics, I mean consider primarily function, buildability (IE. cost and time to build, strength, weight, simplicity, ease of operation and folding/removal), followed by form and aesthetics. Below you can see a few of the submissions. Click here to come comment and vote on them all. Click here to come comment and vote on them all. The word of the day at Local Motors is composites. But not composites in general, composites on the Rally Fighter. Composites are materials made from two or more constituent materials with different physical or chemical properties which remain separate and distinct on a macroscopic level within the finished structure. What a composite is composed of depends on the properties and characteristics that are desired. Ideally the "weaknesses" of one are canceled out by the "strengths" of another producing a better material than what the two are on their own. There are two different composite materials being used on the Rally Fighter. The first is fiberglass we will create ourselves and the second is a thermoplastic called Fiberforge made by the Fiberforge company. Fiberglass is made of a glass fiber fabric placed in an open mold and then saturated with a wet resin by pouring it over the fabric and working it into the fabric and mold. The mold is then left so that the resin will cure. Once cured the piece can then be trimmed and removed from the mold. Fiberforge is a fiber reinforced thermoplastic which is slightly like fiberglass, but is much stronger, modern, and easier to create because of the advance automated process. Check out the following video of Dave Riha (one of LM's Engineer) explaining the use of fiberglass and Fiberforge on the Rally Fighter. Also, tonight at midnight is the end of submissions for the Roof Mounted Light Bar Engineering Competition! Come check out the submissions. Vote on the best design! Now that the jig tables in the shop have been cleared off (see them piled high with parts), we have a new edition of whats on the tables at Local Motors. This time were talking Rally Fighter Chassis development! This is a section of the Rally Fighter chassis that was built for the last BCW (Burgers Cars and Welding). The next BCW will be August 26th, 2009! Come on by! This is only the center section of the frame as you can see in the image below. You can also see a small section of the chassis jig sitting on the passenger side of the chassis. This illustrates the design and building process of the Rally Fighter as we are developing the chassis jigs in unison with the first chassis buildup. But, this was not just slapped together. After countless hours of Solidworks modeling and packaging on the computer this is the final chassis design. 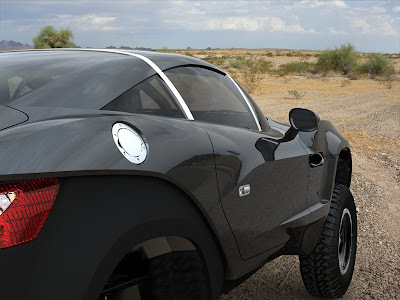 This is a tubular space frame chassis with all of the insane rigidity and strength needed for baja racing, jumping, and anything else you can throw at the Rally Fighter. To start building the first chassis our engineers had to make spec sheets to define every part of tubing. The spec sheet shown here is for the roll bar section of the frame and is what our engineers (Mike Pisani and Dave Riha) gave to our master fabricator Colby Whipple. These sheets explain every piece of tubing that Colby will need to cut, bend, and weld. With the use of the spec sheet above, and many others like it, Colby has completed the center section of the frame pictured in two Solidworks views, and actual picture below. The largest bent tubing piece towards the left of the images is the roll bar, and the square tubing piece to the left of that is the dash bulkhead. Between these two bars is the cabin where seats will be located. In the following image you can see the orientation of the center chassis section in comparison to the rear assembly (axle, watts linkage, wheels, and tires). Also, today was the launch of the Buy Button for the Rally Fighter! Just a $99 deposit to reserving a place in line to buy and build your Rally Fighter. For more Rally Fighter building and engineering check out the Rally Fighter Build Story! Local Motors Roof Mounted Light Bar Engineering competition is open! This is LM's first-ever engineering competition. Click HERE to see the competition page! We are already seeing innovative designs in the checkup section of our site. Two of our entrants in particular, braunarsch and FILSKI, have used the checkup feature and generated great feedback though it. Here are samples of their very cool designs! FILSKI: "Rally Fighter roof lights"
As you can see, their designs and skills are exponentially better than mine! The competition is CAD based, with each participant using their own CAD software skills to design a Roof Mounted Light Bar that will mount to the chassis of the Rally Fighter. To reach this goal, and the ultimate goal of Local Motors, we are making the roof section of the Rally Fighter chassis available for everyone! As you can see in the images above (mainly in braunarsch's), the designers of these light bars rely on the actual frame and light igs files. And if that’s not cool enough…the winning designer gets their name on the actual light bars, $500, and a Solidworks software seat! Its a truly amazing prize. Click here to download the actual Rally Fighter chassis and light igs files. 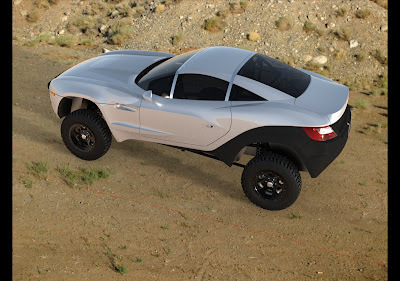 All of us at Local Motors are extremely excited to see more entries! Come compete! First Ever Engineering Competiton Today! Local Motors first-ever engineering competition has launched Today!, July 2, 2009. Click HERE to see the competition! The competition is to design a Roof Mounted Light Bar for the Rally Fighter Race Edition. The competition will be CAD based, with each participant using their own CAD software skills to design a Roof Mounted Light Bar that will mount to the chassis of the Rally Fighter. All of us at Local Motors are extremely excited for this competition!